Very pleased to announce that my painting has been selected by the Royal Institute of Painters in Watercolour for their 206th Exhibition at the Mall Galleries, London. It will take place from 6-21 April, open daily from 10am – 5pm. 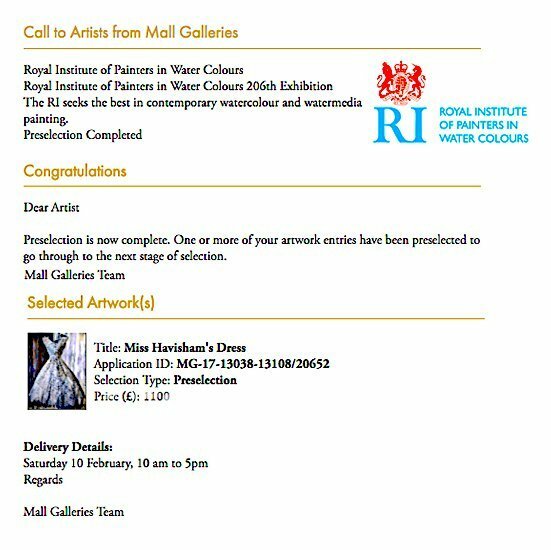 Very pleased to hear that ‘Miss Havisham’s Dress’ (watercolour, ink + gesso) has been pre-selected by the R.I. (Royal Institute of painters in watercolour) for their forthcoming show at the Mall Galleries, London.